Retired Rear Adm. Stanley W. Bryant, a 1964 graduate of Grosse Pointe University School, one of of University Liggett School’s predecessor schools, will receive the 2017 Distinguished Alumni Award during the school’s Alumni Weekend in May. Each year, University Liggett School selects one outstanding graduate to receive the award as part of the school’s Alumni Weekend festivities, May 19-20. Bryant served in the United States Navy for 37 years, where he spent the majority of his time at sea flying tactical aircraft and commanding several large operational Navy units. Following his impressive career with the Navy, he spent six years working in the defense industry. 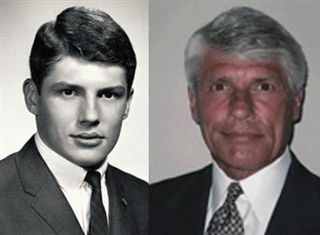 He enlisted in the Naval Reserve just before graduating from high school at GPUS, continuing on to graduate from the United States Naval Academy in 1969. After earning his wings as a Naval Flight Officer, Bryant went to fly an A-6, the most advanced attack airplane in the world at that time. He flew during the Vietnam conflict from the USS Enterprise, the world’s first nuclear-powered aircraft carrier. He went on to retire from an outstanding naval career. Selected for high command after his squadron commanding officer tour, he attended Nuclear Power School, commanded a supply ship and was the Commanding Officer of the USS Theodore Roosevelt aircraft carrier. He commanded the US Naval Forces in Iceland, was a battle group commander, and after he received his second star – the Army requirement of Major General – he served as Deputy Commander to US Naval Forces in Europe until he retired. The Distinguished Alumni Award will add to Bryant's decorated resume, which includes the Distinguished Service Medal, three Distinguished Flying Crosses, the Individual Air Medal, eight Strike/Flight Air Medals and 20 other personal, service and campaign awards. Bryant’s classmate George Perrin GPUS ’64 nominated Bryant for the honor, citing his longtime friend’s outstanding integrity and leadership. “It was clear to all of his GPUS classmates that Stan would be successful at whatever he chose to do in life,” Perrin says. “However, his choice of pursuing a career of military service, and his extraordinary level of achievement, has elevated him well beyond the traditional definition of 'success.' Our class, our school and our country are all thankful for Stan's selfless contributions." Alumni relations director Katie Durno says Bryant enjoyed a remarkable career that was characterized by a deep commitment to service and exceptional achievement. "Stanley could not have been a better fit for our Distinguished Alumni Award," Durno says. "His courage and commitment to protecting our country makes him a great representative of University Liggett School and an inspiration to our students and generations of alumni." Bryant today is an independent military and aerospace consultant and president of IDDEAS L.L.C. He also is a facilitator and guest speaker for the U.S. Naval Academy’s Capstone Leadership and Ethics Program given to Midshipmen in their fourth year at the Academy. He lives in Virginia Beach, Va.
Bryant will join an esteemed group of alumni who have received the award.